For the Lumberjocks 2017 Knife Swap I forged this pair of kitchen knives and sent them to my buddy ToddJB. In a funny twist of events, he gave me the bicycle chain originally… well before I knew my swap recipient. And now the chains are returned back to him in a slightly altered form. 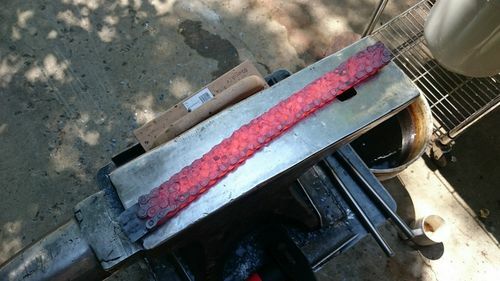 I started by heating bicycle chain layered on top of a 1080 steel backer to nearly 2400 deg F then hammering them together to forge weld into a single solid billet of steel. 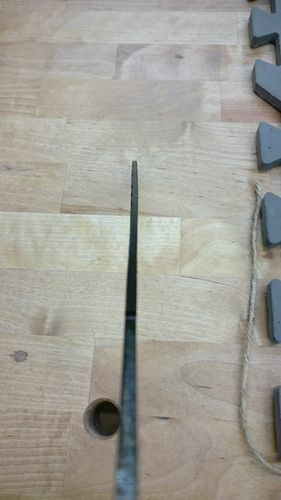 I then forged out the tang, the knife profile, and a bit of the bevels before going to the grinder. 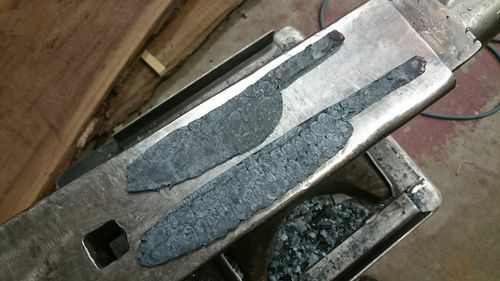 After rough grinding, I heat treated these in the forge and kitchen oven, corrected a major bend in the bigger blade, and then did the finish grinding. 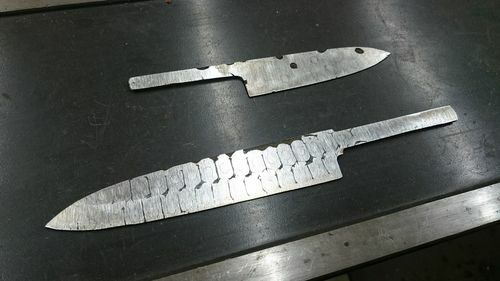 After the knives were shiny, I acid etched them to bring out the pattern. 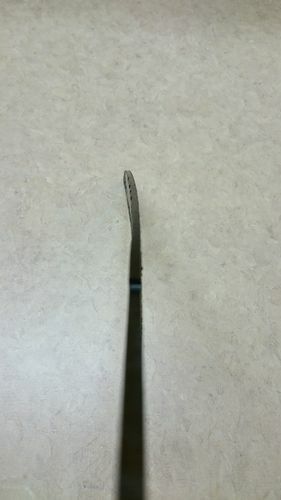 The bigger knife has a 5” diameter hollow grind on the chain side approaching the cutting edge. 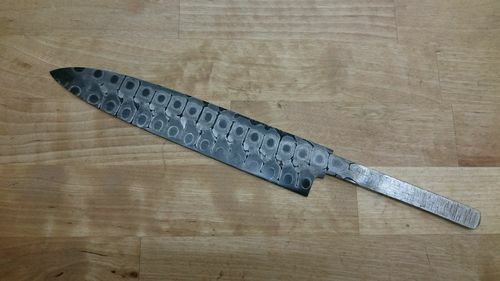 The edge is single bevel (made for lefties like Todd), with the cutting edge entirely made up of 1080 steel since the bike chain steel is unknown. The back is solid 1080 steel with my logo etched on. The smaller knife has chain on both sides with a 1080 core, which didn’t work out as well as I had planned. There ended up being a bit of chain on the cutting edge, so I did an interrupted water quench briefly on the edge only then proceeded with the usual oil quench. 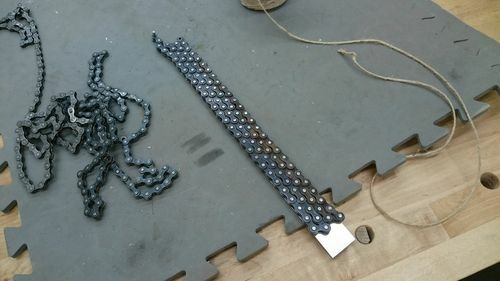 This hardened everything, including the chain bits. The handles are redheart finished with arm-r-seal, then buffed and waxed. 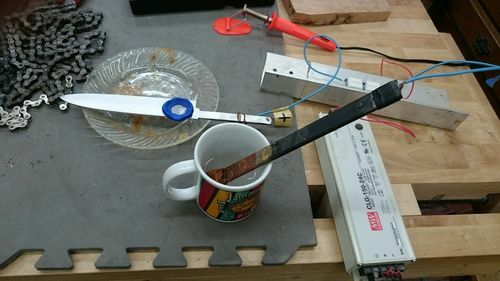 The bigger knife handle is a solid piece of wood using hidden tang construction with just epoxy to hold it in (should be fine for kitchen use). 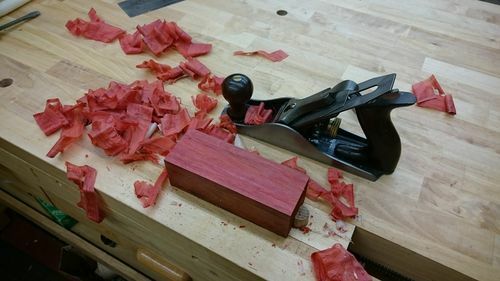 The smaller knife is also hidden tang, but is made with a sandwich of two pieces each hollowed out halfway with a router plane. It is pinned with brass. I used a high-strength flexible epoxy mixed on a lab scale for accuracy (west system g/flex). Those are beauties, Allen. Nice work! So awesome Allen. I put a small forge on my Christmas list. Just for hardening steel. You make me want to go all the way with projects like this though! Maybe in 30 years when I retire :-( Awesome work man, as usual. Beautiful steel and beautiful wood. Allen, is a master among mere poppers. These knives are amazing and work stupid good. I use them frequently so far, and see myself using them for a lifetime. Though I am a little pissed that the chain isn’t really usable any longer. Very nice eye candy. Thanks for sharing your creations. Spalted cherry scales on the knife, and box elder on the awl. Great work overall, looking forward to using them. Wow, that is impressive Allen! Allen, you are truly the master. Those are a very unique and beautiful! The chain link appear to be more dangerous just from seeing the links like scales on a snake! Fascinating! All of it turned out really well. You sir are one talented individual. Very inspiring work. Boy did i screw up on not joining this swap. Those knives are sick! I wouldn’t believe it, if I hadn’t seen it. Beyond comprehension. Very interested as I taught metalwork for many years. Knives where a no no at school. Great workmanship. They really display your versatility. Way beyond my capabilities. As someone who bicycles a lot, I truly like the use of the chain. 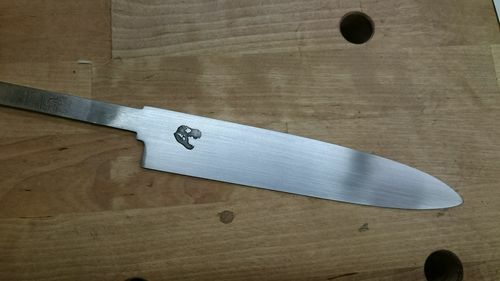 That’s a amazing knife. It’s one of a kind for sure. 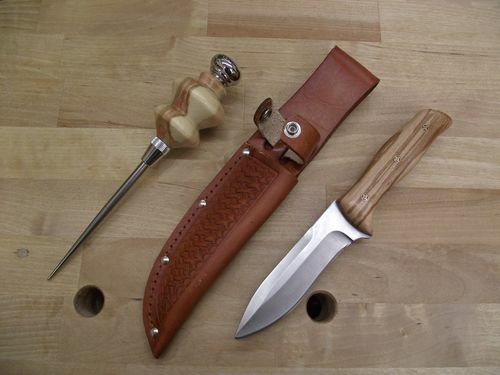 That would be a cool bikers knife.